There are many different definitions of search and rescue, depending on the agency involved and country in question. United States Defense Department: A search is "an operation normally coordinated by a Rescue Coordination Center (RCC) or rescue sub-center, using available personnel and facilities to locate persons in distress" and rescue is "an operation to retrieve persons in distress, provide for their initial medical or other needs, and deliver them to a place of safety". One of the world's earliest well-documented SAR efforts ensued following the 1656 wreck of the Dutch merchant ship Vergulde Draeck off the west coast of Australia. Survivors sought help, and in response three separate SAR missions were conducted, without success. In July 2009, Air France Flight 447 was lost in the middle of the Atlantic Ocean. An international SAR effort was launched, to no avail. A third effort nearly two years later discovered the crash site and recovered the flight recorders. Ground search and rescue is the search for persons who are lost or in distress on land or inland waterways. People may go missing for a variety of reasons. Some may disappear voluntarily, due to issues like domestic abuse. Others disappear for involuntary reasons such as mental illness, getting lost, an accident, death in a location where they cannot be found or, less commonly, due to abduction. Ground search and rescue missions that occur in urban areas should not be confused with "urban search and rescue", which in many jurisdictions refers to the location and extraction of people from collapsed buildings or other entrapments. In most countries, the police are the primary agency for carrying out searches for a missing person on land. Some places have voluntary search and rescue teams that can be called out to assist these searches. 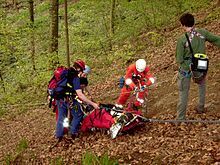 Cave rescue is a highly specialized form of rescue for rescuing injured, trapped or lost cave explorers. Maritime search and rescue is carried out at sea to save sailors and passengers in distress, or the survivors of downed aircraft. The type of agency which carries out maritime search and rescue varies by country; it may variously be the coast guard, navy or voluntary organizations. When a distressed or missing vessel is located, these organizations deploy lifeboats to return them to land. In some cases, the agencies may carry out an air-sea rescue (ASR). This refers to the combined use of aircraft (such as flying boats, floatplanes, amphibious helicopters and non-amphibious helicopters equipped with hoists) and surface vessels. Search and rescue duties in Brazil are the responsibility of the Salvarmar Brasil (MRCC Brazil), of the Brazilian Navy and Divisão de Busca e Salvamento (D-SAR) (English: Search and Rescue Division), of the Brazilian Air Force. 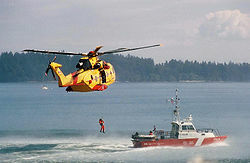 Air and marine Search and rescue duties in Canada are the responsibility of the Canadian Forces and Canadian Coast Guard in conjunction with volunteer organizations. The Department of National Defence (DND) has overall responsibility for the coordinated search and rescue system. SAR operations are organized by Joint Rescue Coordination Centres (JRCC). The JRCC are manned 24 hours a day by SAR Co-ordinators from the Canadian Coast Guard and Canadian Forces. Authority for the provision of maritime SAR is assigned to the Minister of Fisheries and Oceans by the Canada Shipping Act and the Canada Oceans Act. Ground and inland water search and rescue (GSAR) is the responsibility of provinces and territories with the Royal Canadian Mounted Police (RCMP) and other police forces coordinating operations, often using volunteer GSAR teams operating in specific areas under provincial coordinating bodies. Search and Rescue in German waters is conducted by the German Maritime Search and Rescue Service with air support by the German Navy and the German Air Force. All incoming requests are coordinated by the Maritime Rescue Coordination Center in Bremen. The DGzRS is a non-governmental organization entirely supported by donations. Also the German Coast Guard provide SAR services. Besides the offshore Search And Rescue services, the German Air Force provides 3 SAR Command Posts on a 24/7 basis with the Bell UH-1D Huey. The National Search and Rescue Agency of Indonesia known in Indonesian as Badan Nasional Pencarian dan Pertolongan abbreviated "BASARNAS", is a government agency responsible for conducting search and rescue duties nationally in Indonesia. BASARNAS may also be assisted in conducting SAR in Indonesia by the TNI, Mobile Brigade Corps, and local Fire brigade units. Maritime SAR services are provided by two civilian bodies - the Irish Coast Guard and the RNLI. 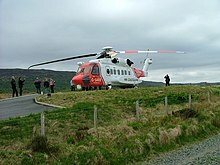 The Coast Guard has responsibility for the Irish Search and Rescue Region. The Royal National Lifeboat Institution has 43 lifeboat stations including inland stations at Enniskillen and Lough Derg, the coastguard inshore rescue boats, and community rescue boats at fifteen stations: Ballinskelligs - Co. Kerry, Ballybunion - Co. Kerry, Ballyheigue - Co. Kerry, Banna - Co. Kerry, Bantry - Co. Cork, Bunmahon - Co. Waterford, Cahore - Co. Wexford, Carna - Co. Galway, Corrib/Mask Lakes - Co. Galway, Derrynane - Co. Kerry, Limerick City (River Shannon), Mallow Search and Rescue - Co. Cork, Schull - Co. Cork, Tramore - Co. Waterford, Waterford City River Rescue, Waterford Marine Search & Rescue. There are some 25 other independent rescue services. The Irish Defence Forces are assigned from time to time to carry out search and rescue operations. Ireland's special forces, the Army Ranger Wing have been used for search and rescue operations in difficult or dangerous operations on land and at sea. The Irish Air Corps are used for rescue and provide top cover for search and rescue over land or sea and is available for maritime and mountain rescue if needed. The Irish Naval Service frequently assists the other agencies in search and rescue. Its patrol ships at sea and the communications center at Haulbowline maintain a 24-hour watch on all distress frequencies. Italian SAR operations are carried out by the Guardia Costiera, backed up by naval aviation and the air force, including 15 ° Stormo, the Italian Red Cross, and other organizations. Kenya's maritime SAR is conducted by the Kenya Maritime Agency while the Kenya Civil Aviation Authority is responsible for Air Traffic SAR within Kenya's waterways and aerospace respectively  . MMEA's Eurocopter AS365 N3 Dauphin used for SAR and surveillance. For ground rescue, Malaysia has two main SAR units, Special Malaysia Disaster Assistance and Rescue Team (SMART) which reports to the National Security Council and Malaysian Fire and Rescue Department (FRDM) Special Tactical Operation and Rescue Team of Malaysia (STORM) unit. They are usually supported by the jungle experts, the aboriginal police unit; Senoi Praaq, Royal Malaysian Police (RMP) VAT 69 Commando, Malaysian Armed Force special operations force and Malaysian Civil Defence Force. [clarification needed] Both SMART and STORM together with other Fire and Rescue Department Special Operations Forces are often involved in international SAR missions. Maritime SAR is the responsibility of Malaysian Maritime Enforcement Agency and FRDM together with support from the Marine Operations Force and the Malaysian Armed Forces. SAR responsibility in the Netherlands is held by the Netherlands Coastguard, carried out by vessels and aircraft from various organisations among which mostly the Royal Netherlands Sea Rescue Institution, the Dutch Lifeguard Association, the Ministry of Transport and Water Management and the Ministry of Defence (Netherlands). Coast Guard Administration (CGA; Chinese: 行政院海岸巡防署; pinyin: Xíngzhèngyuàn Hǎi'àn Xúnfáng Shǔ) is charged with maintaining coastal waters and the pelagic zone patrols, smuggling and stowaway crackdowns, maritime rescues, natural resource conservation, and public services. The CGA is considered a civilian law enforcement agency under the administration of the Executive Yuan, though during emergencies it may be incorporated as part of the Republic of China Armed Forces. In the UK, land-based searches for a missing person are usually coordinated by the local police. There is a network of local volunteer agencies that can be called out to assist these searches, which are part of the Association of Lowland Search And Rescue. Other voluntary agencies exist to provide specialist search and rescue services, such as the Cave Rescue Organisation and Mountain Rescue Committee of Scotland. These organisations are usually called out indirectly by the police. For example, the British Cave Rescue Council advises that if someone goes missing in a cave, callers should contact the local police who will then summon cave rescue. Urban search and rescue units are run by the fire services. Her Majesty's Coastguard are in charge of maritime search and rescue missions. The Coastguard is one of the four emergency services that can be contacted on 999. Their role is to initiate and coordinate the searches. Lifeboats are provided by volunteer agencies, most often by the Royal National Lifeboat Institution. Aircraft for an air-sea rescue were originally provided by the Royal Navy and Royal Air Force. Under the programme SAR-H, they are now operated under contract by Bristow Helicopters. 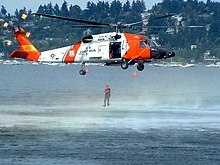 In the United States there are many organizations with SAR responsibilities at the national, state and local level. Most day-to-day SAR missions in the US are run by the County Sheriffs, except in states like AK & AZ where the State Highway Patrol oversees SAR. They in turn, can request help from state and national resources, if they think they need them. A typical Sheriff's Office has a volunteer SAR team that matches the terrain and population of that county. SAR members are typically trained in the Incident Command System (ICS), first aid, and the outdoor skills needed in that terrain and climate. Most of this article is about the federal response to assist large complicated SAR missions. Vietnam Fire and Rescue Police Department is responsible for fire fighting activities. Spanish Air Force Aérospatiale SA330J Puma of the 801 Squadron of the Air Force. Note the lettering reading "SAR". ^ a b Canadian Forces (May 1998). "B–GA–209–001/FP–001 DFO 5449 NATIONAL SAR MANUAL" (PDF). Archived from the original (PDF) on 2008-08-03. Retrieved 2008-07-12. ^ "Search and Rescue - Chapter 9". uscg.mil. Retrieved 26 February 2015. ^ U.S. Department of Defense (January 2006). "U.S. Department of Defense DIRECTIVE NUMBER 3003.01" (PDF). Retrieved 2008-07-12. ^ "Search For Flight MH370 Reportedly Largest In History". NPR.org. 17 March 2014. Retrieved 26 February 2015. ^ U.S. Department of Homeland Security (May 2009). "Urban Search and Rescue (US&R)". Retrieved 2010-01-11. ^ U.S. Department of Homeland Security (May 2009). "About US&R". Retrieved 2010-01-11. ^ a b c Australian Maritime Safety Authority (June 2009). "Search & Rescue". Archived from the original on 2004-04-06. Retrieved 2009-11-04. ^ State of Victoria (June 2007). "Victoria Police Search and Rescue Squad". Retrieved 2009-11-04. ^ Bushwalkers Wilderness Rescue Squad Inc (November 2009). "A remote area search & rescue service for NSW". Retrieved 2009-11-04. ^ Bush Search; Rescue Victoria (October 2009). "Bush Search and Rescue Victoria". Retrieved 2009-11-04. ^ State of New South Wales (December 2008). "About the SES". Retrieved 2009-11-04. ^ Rashad Suleymanov (2009-10-27). "Azerbaijan State Maritime Administration issues statement on rescuing Russia's cargo ship". Azeri Press Agency. Archived from the original on 2011-07-06. Retrieved 2010-12-28. ^ Belgische Defensie (2009). "Vliegbasis Koksijde (Dutch language)". Retrieved 2009-11-04. ^ "Busca e Salvamento (in Portuguese)". Archived from the original on 2012-11-27. ^ Royal Canadian Mounted Police (December 2006). "RCMP Search and Rescue". Retrieved 27 October 2010. ^ Air Force Public Affairs / Department of National Defence (November 2011). "103 Search and Rescue Squadron". Archived from the original on 17 May 2013. Retrieved 8 April 2012. ^ Air Force Public Affairs / Department of National Defence (December 2008). "413 Transport and Rescue Squadron". Archived from the original on 27 August 2012. Retrieved 8 April 2012. ^ Air Force Public Affairs / Department of National Defence (August 2010). "424 Transport and Rescue Squadron". Archived from the original on 13 November 2012. Retrieved 8 April 2012. ^ Air Force Public Affairs / Department of National Defence (December 2008). "435 Transport and Rescue Squadron". Archived from the original on 27 March 2012. Retrieved 8 April 2012. ^ Air Force Public Affairs / Department of National Defence (October 2011). "442 Transport and Rescue Squadron". Archived from the original on 17 May 2013. Retrieved 8 April 2012. ^ Air Force Public Affairs / Department of National Defence (April 2012). "417 Combat Support Squadron". Archived from the original on 13 November 2012. Retrieved 8 April 2012. ^ Air Force Public Affairs / Department of National Defence (December 2008). "439 Combat Support Squadron". Archived from the original on 11 May 2012. Retrieved 8 April 2012. ^ Air Force Public Affairs / Department of National Defence (April 2012). "444 Combat Support Squadron". Archived from the original on 13 November 2012. Retrieved 8 April 2012. ^ "British Columbia Search and Rescue Association". 2019. Retrieved 6 Jan 2019. ^ Alberta / BC Cave Rescue (2018). "Alberta / BC Cave Rescue". Retrieved 30 Nov 2018. ^ Canada Task Force 2 (2010). "Canadian Task Force Two". Retrieved 24 July 2011. ^ Civil Air Search and Rescue Association (2006). "Civil Air Search and Rescue Association National Website". Retrieved 2009-05-11. ^ a b "ERT Search and Rescue". ^ Technical Search and Rescue (2010). "Technical Search and Rescue". Retrieved 2010-01-18. ^ "Halifax Regional Search & Rescue". halifaxsar.ca. Retrieved 26 February 2015. ^ North Shore Rescue (2009). "North Shore Rescue". Retrieved 2009-03-21. ^ "Pincher Creek Search & Rescue". Archived from the original on 2004-06-13. Retrieved 28 July 2012. ^ Québec Secours (2009). "Québec Secours". Retrieved 2009-05-08. ^ Nocturne Communications (2004). "River Valley Ground Search and Rescue". Archived from the original on February 7, 2007. Retrieved 2009-04-07. ^ Roberts Bank Lifeboat (January 2010). "Roberts Bank Lifeboat". Retrieved 2010-01-20. ^ "About RCM-SAR". Rcmsar.com. Archived from the original on 2012-05-31. Retrieved 2012-07-11. ^ Sauvetage Bénévole Outaouais - Ottawa Volunteer Search and Rescue (December 2014). "Sauvetage Bénévole Outaouais - Ottawa Volunteer Search and Rescue (SBO-OVSAR)". Retrieved 2014-12-29. ^ "Search and Rescue Manitoba". September 2010. Retrieved 2010-09-13. ^ Canadian Task Force One (2010). "Canadian Task Force One". Retrieved 2010-01-18. ^ "York Sunbury Search and Rescue - Home". yssr.nb.ca. Archived from the original on 26 March 2012. Retrieved 4 July 2015. ^ "OCEAN7 - das österreichische Yachtmagazin | OCEAN7 2013 » News-Archiv: SAR, mehr Einsätze in Kroatien". Ocean7.at. Retrieved 2014-06-28. ^ "Danish air force S-61A fact sheet" (PDF) (in Danish). Archived from the original (PDF) on 2008-08-03. Retrieved 2008-07-09. ^ "Pictures from the public display". Archived from the original on September 27, 2007. Retrieved 2008-07-09. ^ "Kystredning i Danmark" (in Danish). Archived from the original on 2008-05-11. Retrieved 2008-07-09. ^ "Piirivalve ajalugu ja sümboolika (In Estonian language)". Archived from the original on 2007-06-10. ^ Suomen Pelastusalan Keskusjärjestö. "Turvalliseen huomiseen (Finnish language)". Retrieved 2009-09-21. ^ Suomen Meripelastusseura Ry. "SAR - Search and rescue (Finnish language)". Archived from the original on 2009-09-03. Retrieved 2009-09-21. ^ Punainen Risti (n.d.). "Finnish Red Cross". Archived from the original on 2009-05-19. Retrieved 2009-09-21. ^ "German Maritime Search and Rescue Service (DGzRS)". Archived from the original on 2008-09-13. Retrieved 2008-08-27. ^ rth.info (2002). "Bundeswehr (in German language)". Retrieved 2008-05-22. ^ "Search and rescue". Archived from the original on 2007-05-04. Retrieved 2010-01-21. ^ a b "The Government Flying Service". Hong Kong Special Administrative Region Government. August 14, 2008. Retrieved 15 May 2010. ^ "Civil Aid Service Hong Kong". Safety Training. Government of the Hong Kong Special Administrative Region. 2010. Retrieved 15 May 2010. ^ Icelandic Coast Guard (n.d.). "The Icelandic Coast Guard". Retrieved 2008-03-07. ^ Slysavarnafélaginu Landsbjörg (n.d.). "ICE-SAR A Tale of Great Achievements". Retrieved 2008-03-07. ^ Skógarhlíð (January 2010). "Reports from Haiti". Retrieved 2010-01-23. ^ "Home." (Archive) National Search and Rescue Agency. Retrieved on 10 May 2012. "Jl. Angkasa Blok B.15 KAV 2-3 Kemayoran - Jakarta Pusat Jakarta - Indonesia 10720"
^ Department of Transport. "Irish Coast Guard IRCG". Retrieved 2015-02-20. ^ Department of Transport. "The Irish Search and Rescue Region". Retrieved 2015-02-20. ^ "RNLI Lifeboat Stations in Ireland". Royal National Lifeboat Institution. Archived from the original on 22 July 2009. Retrieved 6 October 2009. ^ "Coastguard Teams". Irish Coast Guard. Archived from the original on 21 July 2011. Retrieved 6 October 2009. ^ "Community Rescue Boats Ireland". Irish Water Safety. 2 April 2014. Retrieved 2 April 2014. ^ "Community Rescue Boats Ireland (CRBI)". Retrieved 17 February 2015. ^ Mountain Rescue Ireland (2009). "Team Information". Archived from the original on 2009-12-25. Retrieved 2010-01-05. ^ "Info Centre - Defence Forces". military.ie. Archived from the original on 26 November 2010. Retrieved 26 February 2015. ^ "Organisation". military.ie. Archived from the original on 16 October 2007. Retrieved 26 February 2015. ^ "Organisation". military.ie. Archived from the original on 26 November 2010. Retrieved 26 February 2015. ^ "Organisation - Naval Service - Defence Forces". military.ie. Archived from the original on 15 October 2007. Retrieved 26 February 2015. ^ The Home Front Command (n.d.). "Combat SAR battalions Shahar and Kedem". Retrieved 18 May 2011. ^ Capitanerie di porto - Guardia Costiera (2006). "Capitanerie di porto - Guardia Costiera". Archived from the original on 2008-07-29. Retrieved 2008-11-11. ^ "Il portale dell'Aeronautica Militare - 15° Stormo". difesa.it. Retrieved 26 February 2015. ^ Croce Rossa Italiana. "Croce Rossa Italiana - Home". www.cri.it. Archived from the original on 7 February 2015. Retrieved 26 February 2015. ^ "SDC Iraq, Jordan, Lebanon and Syria - News Detail". Swiss-cooperation.admin.ch. 2013-05-23. Retrieved 2013-07-21. ^ Maritime Administration (n.d.). "Maritime Services". Retrieved 2018-08-30. ^ Civil Aerospace Administration (n.d.). "Aeronautical Services". Retrieved 2018-08-30. ^ Maritime Administration (n.d.). "Maritime Services". Retrieved 2010-01-11. ^ "SMART, STORM sertai SAR". HM Online (in Malay). 2015-06-06. Retrieved 2017-04-29. ^ "Bomba sedia hantar anggota Storm ke Nepal". Retrieved 2017-04-30. ^ Harian, Wartawan Sinar. "Berjuang di bumi berasap". Retrieved 2017-04-30. ^ "Bomba Malaysia sedia bantu Indonesia padam kebakaran hutan". BH Online. 2015-10-04. Retrieved 2017-04-30. ^ "Malaysia Country Report 1999: Forest Fire And Severe Haze". www.adrc.asia. Retrieved 2017-04-30. ^ "MMEA: Search and rescue for six missing victims in capsized catamaran continues". 2017-01-30. Retrieved 2017-04-30. ^ "MMEA to review SAR ops after rescue team missed survivors by 'minutes'". 2016-05-13. Retrieved 2017-04-30. ^ Search and Rescue Training Centre - Armed Forces of Malta (2004). "Search and Rescue (SAR) in Malta". Archived from the original on 2008-11-20. Retrieved 2008-03-13. ^ "Search and Rescue training". YouTube. 2007-11-29. Retrieved 2012-04-08. ^ Search and Rescue Training Centre - Armed Forces of Malta (2004). "Search and Rescue Training Centre - AFM". Archived from the original on 2008-11-20. Retrieved 2008-03-13. ^ U.S. Department of State. (November 2007). "AFM SAR TC Graduation". Archived from the original on December 25, 2007. Retrieved 2008-03-13. ^ Brincat, Erika F. (n.d.). "Search and rescue training certificates awarded". Archived from the original on 2011-07-22. Retrieved 2008-03-13. ^ MaltaMedia News. (January 2008). "Search & Rescue meeting between Libya and Malta". Retrieved 2008-03-15. ^ a b Civil Aviation Auithority of New Zealand (n.d.). "AIPA New Zealand GEN 3.6 Search and Rescue". Retrieved 2008-02-24. ^ "About our Rescue Coordination Centre New Zealand (RCCNZ)". Maritime New Zealand. n.d. Retrieved 30 May 2010. ^ Maritime New Zealand (n.d.). "Contact RCCNZ". Retrieved 30 May 2010. ^ "New Zealand Fire Service - Urban Search and Rescue (USAR)". Fire.org.nz. Archived from the original on 2012-07-02. Retrieved 2012-04-08. ^ "The Ministry of Civil Defence & Emergency Management: NZ Response Teams". Civildefence.govt.nz. 2011-01-14. Retrieved 2012-04-08. ^ "Search Dogs New Zealand Official Search & Rescue Dogs NZ Land SAR Search Dogs". searchdogs.co.nz. Retrieved 26 February 2015. ^ "Força Aérea Portuguesa". emfa.pt. Retrieved 26 February 2015. ^ "Santa Maria Oceanic FIR - Portugal vACC". portugal-vacc.org. Retrieved 26 February 2015. ^ "Morska Służba Poszukiwania i Ratownictwa". sar.gov.pl. Retrieved 26 February 2015. ^ SASAR (n.d.). "Who are we?". Archived from the original on 2008-09-14. Retrieved 2008-11-13. ^ Wilderness Search; Rescue, Western Cape (n.d.). "Wilderness Search and Rescue, Western Cape". Archived from the original on 2004-01-27. Retrieved 2009-11-06. ^ The Off Road Rescue Unit (n.d.). "The Off Road Rescue Unit". Retrieved 2014-09-11. ^ Rescue South Africa (n.d.). "Rescue South Africa". Retrieved 2011-08-26. ^ K9 Search and Rescue (n.d.). "K9 Search and Rescue". Retrieved 2014-09-11. ^ Salvamento Marítimo (n.d.). "Salvamento Marítimo (Spanish)". Archived from the original on March 30, 2010. Retrieved 18 May 2011. ^ Swedish Maritime Administration (January 2011). "Maritime Search and Rescue". Archived from the original on 11 June 2011. Retrieved 29 April 2011. ^ "Vi räddar liv till sjöss". Archived from the original on 28 February 2012. Retrieved 9 March 2012. ^ "Error 404; Seite nicht gefunden". rega.ch. Retrieved 26 February 2015. ^ "AN OUTLINE OF INTERIOR AFFAIRS. REPUBLIC OF CHINA 2013-National Airborne Service". Moi.gov.tw. 2013-12-03. Archived from the original on 2014-02-01. Retrieved 2014-04-22. ^ "Coast Guard Administration, Executive Yuan-Our Minister-A Word from the Minister". cga.gov.tw. Retrieved 4 July 2015. ^ "Search and rescue helicopters". Department for Transport. 26 March 2013. Retrieved 2013-03-31. ^ SEBEV Search & Rescue (November 2009). "SEBEV Search and Rescue". Retrieved 2009-10-18. ^ Cheshire Search and Rescue (n.d.). "Cheshire Search and Rescue". Retrieved 2016-04-11. ^ "Hampshire Search and Rescue". Retrieved 2018-09-07. ^ LAMRT (May 2011). "Langdale Ambleside MRT". Retrieved 7 May 2011. ^ "Norfolk Lowland Search and Rescue". ^ "Northamptonshire Search and Rescue". ^ "Lowland Rescue Search Dogs Sussex". ^ SULSAR Search & Rescue (April 2015). "SULSAR Search and Rescue". Retrieved 2009-10-18. ^ Surrey Today (January 2011). "Volunteers needed to aid search and rescue". Archived from the original on 2011-07-23. Retrieved 20 June 2011. ^ "Santa Clara County Sheriff Search and Rescue". ^ a b O'Toole, Thomas F. (n.d.). "Committee F32 on Search and Rescue". Retrieved 2008-02-24. ^ "Hệ thống thông tin VBQPPL". moj.gov.vn. Retrieved 6 March 2016. ^ "Xây dựng lực lượng cứu hộ-cứu nạn chính quy và hiện đại". VOV - ĐÀI TIẾNG NÓI VIỆT NAM. Retrieved 4 July 2015. ^ Administrator. "Tรกยปย• chรกยปยฉc bรกยปย mรยกy lรกยปยฑc lรยฐรกยปยฃng Cรกยบยฃnh sรยกt phรยฒng chรยกy vร chรกยปยฏa chรยกy". canhsat.vn. Archived from the original on 30 October 2012. Retrieved 26 February 2015. ^ "Tìm kiếm cứu nạn (SAR)". vatm.vn. Archived from the original on 26 February 2015. Retrieved 26 February 2015. This page was last edited on 1 April 2019, at 23:20 (UTC).